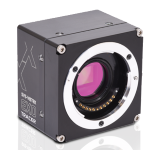 The exo "Tracer" blends a Sony Pregius IMX304 sensor with the Micro-Four-Thirds lens standard. The result is a flexible imaging solution that delivers excellent image quality. The user has full control of lens zoom, focus and aperture through GenICam parameters, making for a seamless solution easily integrated with existing software.